This issue we are looking at some common concerns raised by older people living in the inner city. We explore some rights that are infringed and provide some wellbeing tips that contribute towards positive ageing. The big picture is that people are living longer and our communities will increasingly have more and more people aged over 85. After the second world war there was a social compact that encouraged people into housing purchase, kept housing prices in line with real wages and provided affordable rental housing for those that could not reach the “home-owner dream”. As a consequence, when people stopped working they had usually lived in a purchased home or had secure public housing rental accommodation. This with a modest pension provided some security into old age. This compact has fractured for many older people living in inner Sydney due to rising cost of living, ageism in the workforce and pressure to support younger family members. You will see some of these issues unpacked in three articles across this issue. 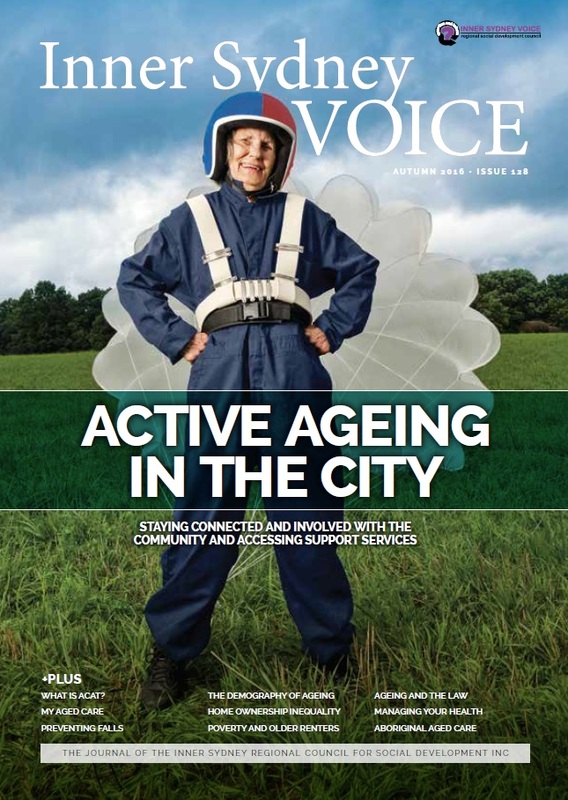 In Seniors: an increasingly important part of communities Stephanie Hull a demographer tells us that even in the youth focused Inner Sydney we will see a significant increase in the number of people over 65. Ben Spies-Butcher unpacks Changing home ownership and growing inequality while Robert Mowbray explores the consequences of these changes especially for those who are single and female in Older renters: The new face of poverty. The face of aging services is also changing so in this issue we explain the key entry points for services in What is ACAT? and What is My Aged Care. We also have a look at Wyanga and some of the aspirations for The role of community in Aboriginal Aged Care. Falls are a big issue, both for those who fall and the healthcare system, which is why we provide some practical tips on Preventing falls. We also make some suggestions on Help in navigating the health system and on Mental health as we age. It is not just in the health system that aging people become vulnerable, so we have also looked broadly at Your voice your rights: Ageing and the law and in another article looked specifically at What is elder abuse?. Our two final articles also have relevance to ageing, although they have been written for a wider audience, following our earlier Mental Health and Developing Communities issues. Social isolation is a challenge for many across the age spectrum so this issue we cover a City of Sydney, City West Housing, Harmony Day project in Building Social Connections: #justsayhisydney. Another innovative project Books for Better Mental Health is training mental health workers to explore the healing potential of great literature. From the vault revisits the House of Representatives Home and Community Care Inquiry Home but not Alone – HACC – Spring 1994 from Spring 1994.